We love shredded chicken in our tacos, casseroles, quesadillas, salads, sandwiches... okay, we just love shredded chicken. What we don't love is the actual process of shredding it. Often, we use the ol' forks method of holding the chicken down in the center with one fork and using a second fork to pull it to shreds. It's a bit time-consuming and sloppy, to say the least. 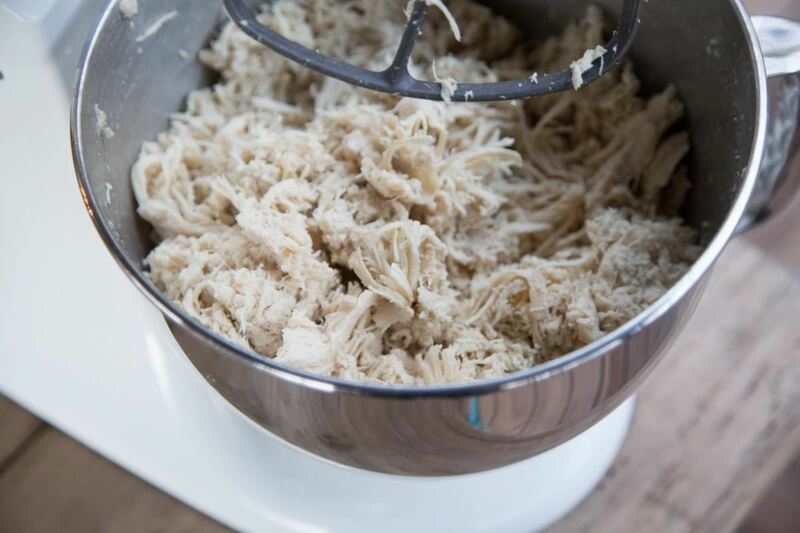 So as avid chicken shredders, our minds were blown when we realized we could actually shred the chicken faster and more easily with a hand or stand mixer. Begin by tearing apart the chicken a bit first with your hands, to make it easier for the beaters to get in there. Place the chicken into a deep mixing bowl and press the beaters into it. 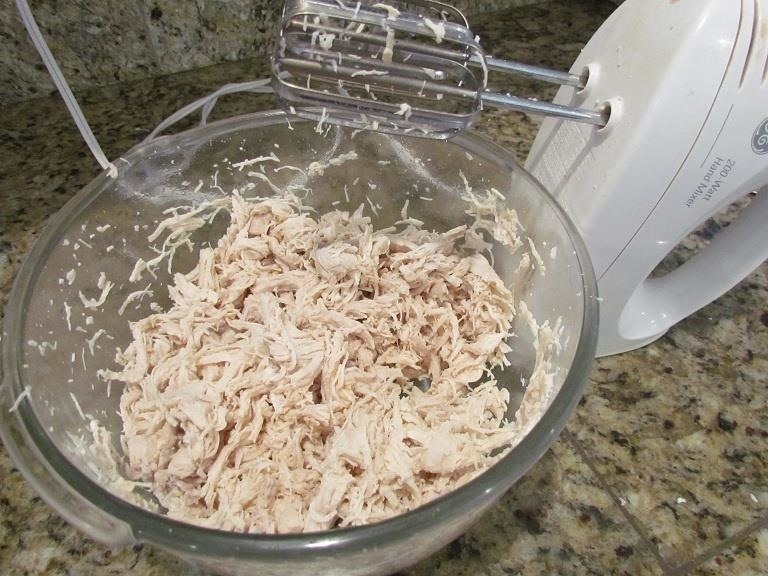 Turn the hand mixer on low speed, and let it do its thing until the chicken is fully shredded. Place your cooked, boneless chicken into the bowl of a stand mixer. This works with breasts, thighs, and whole rotisserie chicken removed from the bones. Make sure your paddle attachment is firmly in place and your mixer's arm is locked, then turn the mixer on at a low speed. Let the paddle work its magic for 2 to 3 minutes or until the chicken is fully shredded. And voilà—easy as chicken pie! Now that you have a whole pile of shredded chicken, you need some creative ways to put it to clucking good use. Here are a few of our favorite recipes from around the web that put shredded chicken in the spotlight. 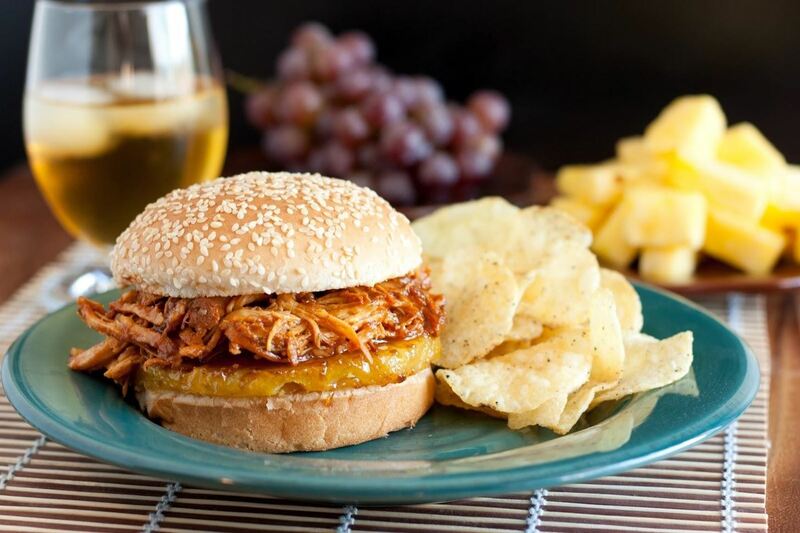 Jaclyn of Cooking Classy uses shredded chicken and a pineapple slice for Hawaiian BBQ pulled chicken sandwiches. Serve them alongside some gourmet potato chips and a Mai Tai and let the backyard luau ensue. 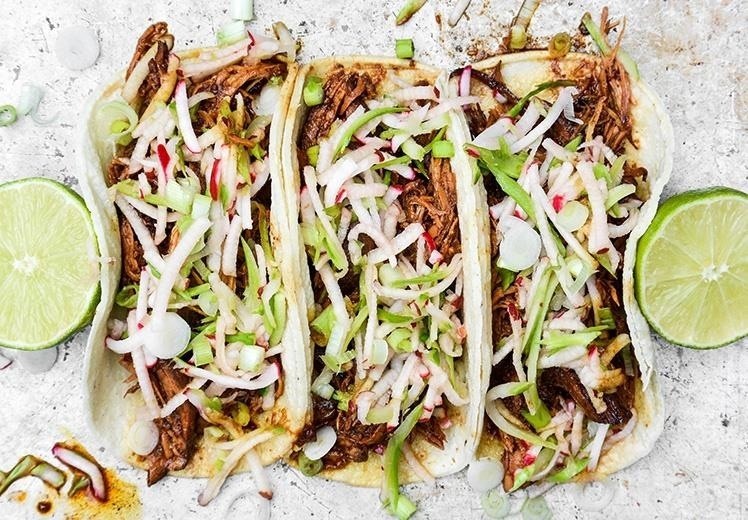 Liz from Floating Kitchen uses blackberry preserves and hoisin sauce to make delightful shredded chicken tacos. She tops them with a refreshing broccoli slaw made with apples, radish, and lime juice. 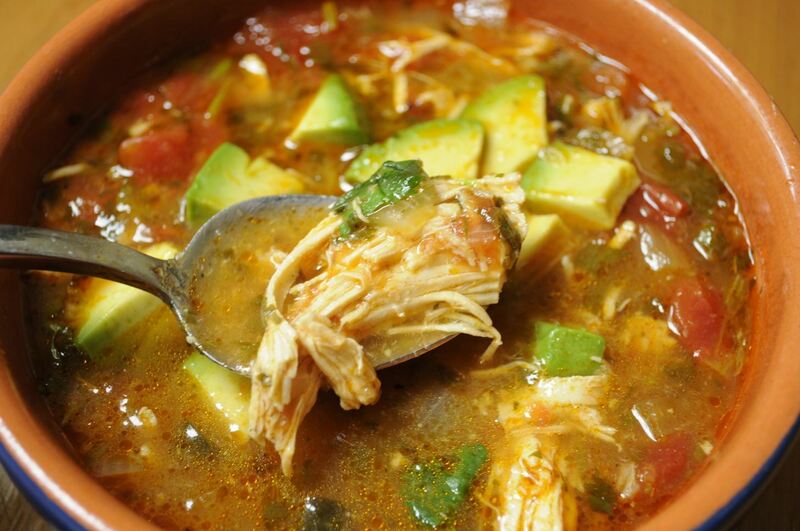 The Mayfields make a stellar paleo (shredded) chicken tortilla soup which is topped with diced avocado, cilantro, and fresh lime. Tortilla soup is a great dish to make a lot of and keep for leftovers (a side of warm tortillas to dip is a nice addition, too). Shredded chicken is a divine addition to salads like this Asian chicken salad from Nagi of Recipe Tin Eats. 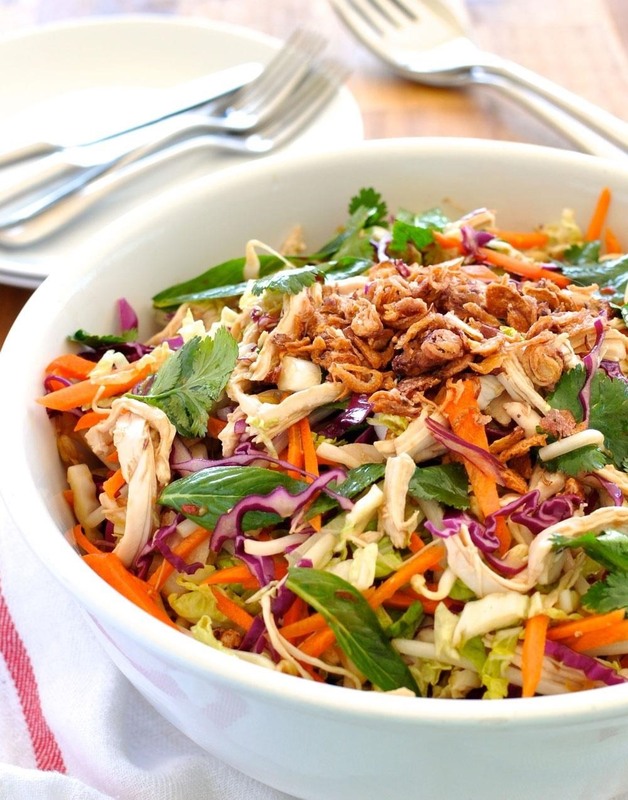 She uses shredded chicken, carrots, and cabbage, and tosses it all with fresh herbs and a tangy Asian dressing. 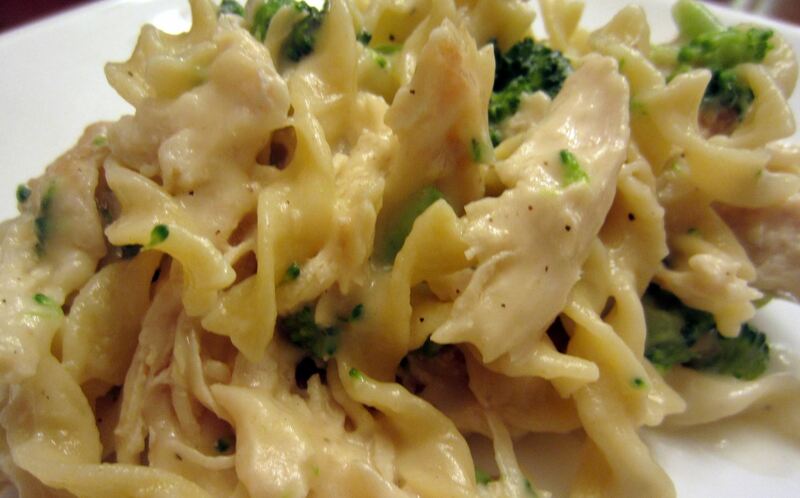 And finally, if it's pasta you've got a hankering for, the gals at Fabulessly Frugal have you covered with this glorious chicken, cheese, and broccoli pasta. Mix that precooked shredded chicken with hearty egg noodles, some shredded cheddar, and steamed broccoli florets for a comforting classic stovetop meal. We hope this handy dandy shredding trick saves you time and energy, and inspires you to create more dishes with our culinary friend, the chicken. By using a mixer, you can go from the blank slate of prepared poultry to a creatively masterful meal in no time flat. Have any favorite ways you like to use shredded chicken? Share them with us in the comments below!